Professor Mahan Mirza looks out over his classroom, pausing from his lecture to gaze at the row of attentive faces stretched befor him. The class is Freshman Rhetoric, and the students have just finished discussing the merits of a speech by president Ronald Reagan. Time is up, and people are already softly packing away their notebooks into book bags, barely listening as the professor ticks off the homework assignment for the next session — another speech, this time by Ted Kennedy.The scene would probably feel commonplace to any American college student who has waited eagerly for a professor to end a lesson. But what Mirza does next is something altogether different: before dismissing the class, he closes his eyes, bows his head, and recites an Islamic prayer in Arabic. All the students stop for a moment, then bow their heads solemnly as well — because every one of them is Muslim. There are a few hints that this may not be an average college classroom, of course. The small lecture hall is split down the middle between men and women, a firm gender separation accented by flashes of Islamic tradition: some of the men wear Muslim garb and head coverings, and most women are wrapped in brightly colored hijabs. But a few wear their hair exposed and flowing, and a majority of the men are clad in hoodies, t-shirts, and the occasional Steelers jacket. What’s more, the dynamics are roughly the same as you would find in any co-ed college classroom, albeit with an unusually high level of gender parity: men and women spoke roughly equal time over the course of Mirza’s lecture, never once interrupting each other. Such is the uncommon atmosphere of Zaytuna College, America’s first — and currently, only — accredited Muslim college, located in Berkeley, California. Founded in 2009, the tiny but growing school touts itself as singularly focused on fusing the western concept of the liberal arts — where students are steeped in classical logic and rhetoric — with a distinctly Islamic education that requires, among other things, proficiency in Quranic studies. And aside from gender-divided classes, there are other, less-visible signals that the school is working to balance traditional academia with Muslim tradition: Islam generally abhors usury and debt, so every Zaytuna student that cannot afford tuition attends classes for free, benefitting from financial aid programs and scholarships that do not incur interest. The money comes from members of the Muslim community donating to the school as their zakat, an Islamic practice similar to Christian tradition of giving alms. “We believe knowledge is sacred. That’s part of our tradition,” said Hatem Bazian, one of the leading scholars who helped found the college. And now, as the United States endures an unprecedented wave of Islamophobia — where American Muslims are dismissed by politicians as foreign invaders — that tradition ensures Zaytuna is rapidly becoming the nation’s epicenter of Islamic thought. The students it produces stand to represent the future of a decidedly American form of Islamic leadership, an increasingly important role thrust upon them as the United States struggles to embrace its growing Muslim-American population. It’s hard to find Zaytuna College, tucked away among the sunny peaks of “holy hill,” a collection of seminaries and religious schools perched just above the main campus of the University of California, Berkeley. And it certainly doesn’t look like a stereotypical bastion of Islamic thought. The school’s main building isn’t a mosque, nor is it a shining example of traditional Islamic architecture. Rather, Zaytuna is housed in the onetime home of a United Church of Christ congregation, where the sanctuary has been retrofitted into a lecture hall and classes are held in spaces once set aside for Christian Sunday School. Worn, metal markers designating Christian church offices still hang untouched on hallway walls, and the sign out front is simply a canvass image of Zaytuna’s logo wrapped tightly around a former church sign. Despite appearances, however, the church — along with another nearby building acquired from a Catholic order — now houses a growing Islamic institution, where dozens of hijab and taqiyah-clad students bustle in and out each day to pursue their studies. Administrators admit that the property, first acquired in 2015, is something students and faculty are still getting used to. The school was originally founded in 1996 by Muslim scholars Hamza Yusuf and Hesham Alalusi as the “Zaytuna Institute” in Hayward, California, but has taken on a variety of forms over the years — including a brief stint as a Muslim seminary program, which graduated five students in 2008 — usually without a dedicated home. 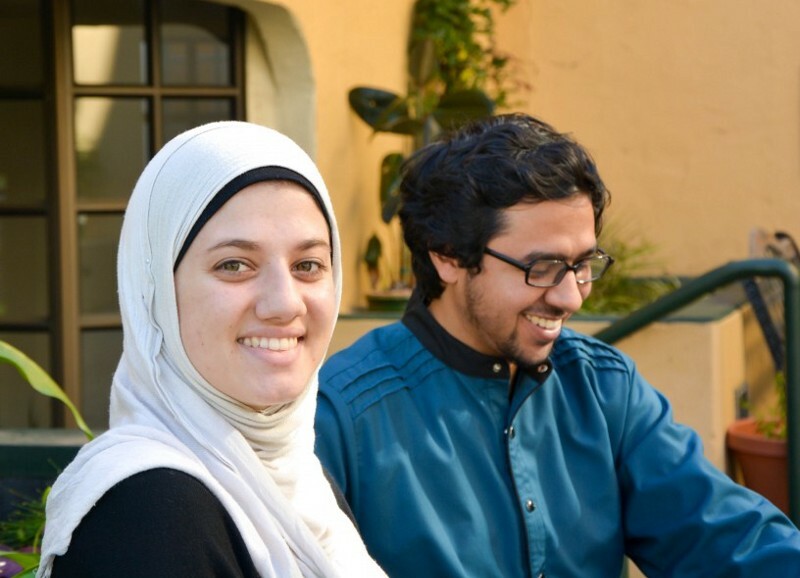 By 2009, the original founders felt their school would be a better fit for students at the college level, so they, along with Bazian, reimagined the institute as Zaytuna College and welcomed their first freshman class in 2010. But unlike other centers of Muslim thought in the United States, which tend to focus solely on the study of Islam and the Quran, Zaytuna is setting out to do something altogether different. It was created with the dream of establishing an Islamic version of a classically western — and unmistakably American — institution: a faith-based liberal arts college. The result is a tiny school — just around 60 students — that tackles the very large goal of balancing Islamic instruction alongside the “western canon,” or works produced by famous philosophers such as Aristotle and Plato. It’s a new take on an old system, and so far, it seems to be working: the college managed to gain accreditation with blinding speed (it was authorized by the Western Association of Schools and Colleges in 2015), and remains passionately dedicated to a unique, rigorous curriculum, which is set for all students from year one. Classes range from traditional Islamic disciplines, such as Quranic exegesis and Islamic thought, to courses more familiar to western eyes, such as rhetoric and ancient philosophy. 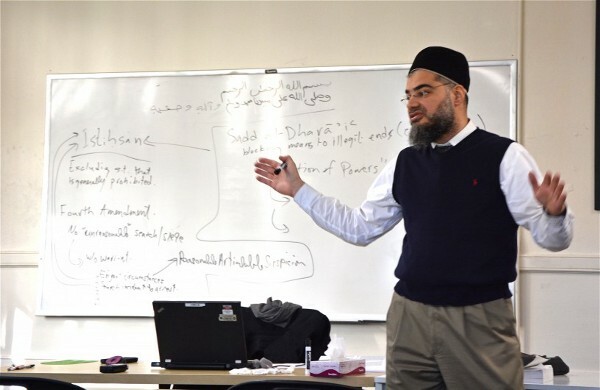 Sitting in front of a whiteboard covered with a mixture of Islamic verses and quotes from former U.S. Supreme Court justices, Munes Tomeh, a kinetic, bespectacled professor who teaches the school’s constitutional law course, explained that classroom instruction often taps into this synthesis of holy and secular. 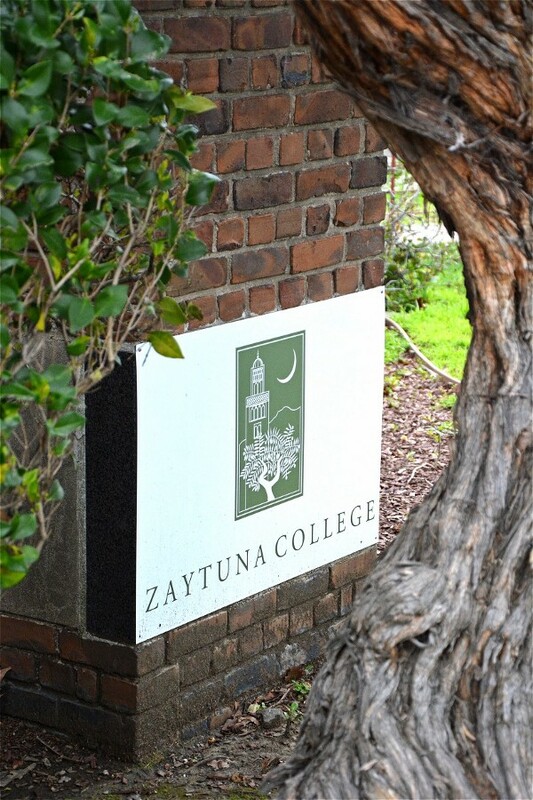 Zaytuna essentially mimics the belief-focused education modeled by America’s innumerable faith-based liberal arts schools such as Wheaton College, Yeshiva University, or Gonzaga University. But Zaytuna’s firm embrace of Islam instead of Christianity or Judaism is unique among the country’s four-year institutions of higher learning. And the modern context in which Zaytuna operates — where militant groups wage terrorist attacks while claiming to represent Islam, and where Islamophobia has become a talking point for leading presidential candidates — has significantly raised the profile and influence of the small school. Perhaps the most unusual — and most Muslim — aspect of the school isn’t necessarily what it teaches its students, but how it forms them as people. Although Zaytuna doesn’t mandate that students be Muslim (“We had one non-Muslim applicant. We accepted her. She went somewhere else,” Mirza said), enrollees are encouraged to ground their activities both inside and outside the classroom in an Islamic moral framework — all while maintaining an informed worldview. Mark Delp, a philosophy professor at Zaytuna and one of two non-Muslims who teach at the school (he identifies as Christian), noted that students — colloquially referred to as “Zaytunis” — are often surprised by the overlap between western thought and Islamic tradition. “Islamic philosophy, at least in the main thrust of it…It’s almost identical with the Latin scholastic philosophy,” he said. 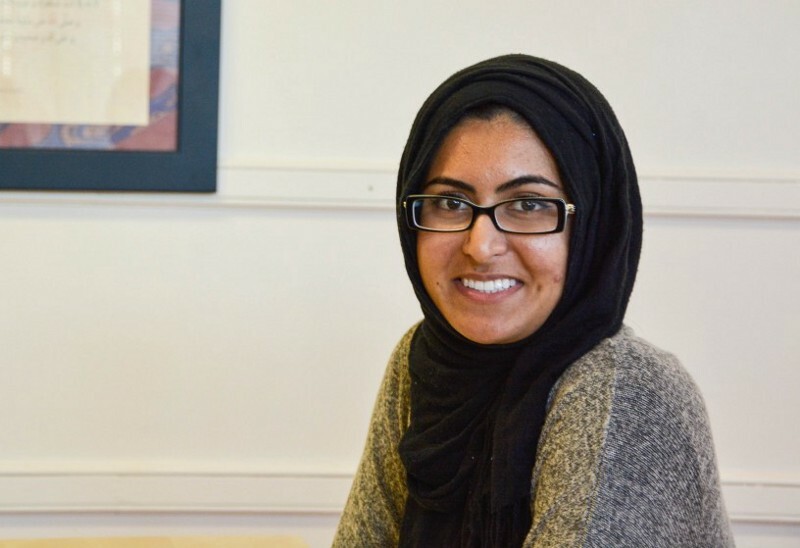 Indeed, Zaytuna students like Reema Lateef — a senior who hails from Orlando, but speaks with a lilting, sing-song accent that would be right at home in Orange County, California — appear to have taken the administration’s efforts to heart. Lateef explained that while she came to Zaytuna partly to “experience engaging and living around other Muslims” (“I didn’t grow up around a lot of practicing Muslims in Orlando,” she said), the college’s marriage of liberal arts and Islam also spoke to her in a way that larger, secular colleges didn’t. And Lateef, who volunteers part-time at a domestic violence shelter, managed to merge her academic and real-world interests for her senior thesis, an exhaustive project required of all graduates. Her work takes a critical look at sexual consent, for both men and women, under Islamic law. Life at the college isn’t always about homework and career goals, of course. Like most college youth, students find time for fun in non-academic clubs: some meet for archery practice each week, a few write stories for the school’s student-run publication, and still others gather as part of a musical singing group described as “Muslim a capella.” A newly installed ping-pong table has led to a number of rowdy, blistering tournaments between classes. In addition to their studies, Zaytuna students admitted that, as pupils at America’s first Muslim college, they sometimes feel pressure to act as representatives for all U.S. Muslims. Most said that they haven’t experience Islamophobia in liberal Berkeley, but cited discomfort with the growing tide of anti-Muslim hatred in the United States, especially the vitriol of Donald Trump — a phenomenon they feel obligated to resist. Several of the students had already been interviewed for news stories about American Muslims in the past, a trend they expect to increase only with time. The school has only handed out diplomas to two classes, but administrators are quick to point to Zaytuna graduates who are already making a name for themselves as positive, public Muslim leaders. For instance, when several African American churches burned to the ground last summer in the wake of the tragic shooting in Charleston, South Carolina, news outlets noted that a Muslim organization raised more than $100,070 to help the congregations rebuild — a higher sum than several Christian organizations accumulated in the same time period. The lead organizer for the effort? Faatimah Knight, a Zaytuna graduate. Zaytunis contend that public gestures of goodwill aren’t the only way to change hearts and minds about Islam, however. Embedded in Zaytuna’s academic mission is an unspoken belief that the best way to combat anti-Muslim hatred is to produce educated, productive members of American society. Meanwhile, Zaytuna’s three founders have effectively become ambassadors for American Islam, especially Hamza Yusuf, who travels the world to deliver talks to sprawling crowds. Predictably, their vocal opposition to Islamophobia has earned them criticism from the country’s anti-Islam factions, some of whom try to paint the scholars as anti-American. “I have to constantly educate wherever I go — which isn’t that bad for an educator!” Bazian said. While Zaytuna’s religious teachings are deeply grounded in ancient Muslim traditions, they’re already pushing boundaries in some Islamic communities — something that Tumeh noted is not unusual among American academic institutions. Zaytuna’s American flavor of Islamic scholarship — now imbued within a growing generation of its college graduates — is actively challenging Muslims outside the U.S., and has even stoked the fury of terrorist groups that claim to represent Islam. When militants affiliated with ISIS brutally gunned down journalists at the Paris, France-based Charlie Hebdo magazine in 2015, for instance, Yusuf was one of several American scholars to release statementscondemning the attacks. When ISIS published a recruitment magazine later that year with an article decrying certain Muslim scholars as apostates, the image alongside the text was of Yusuf, chastising him for speaking out against the shooting. Zaytuna is also building a bond with other American religious institutions, which tend to respect each other as faith organizations, regardless of theological differences. This affinity became apparent during a recent kerfuffle surrounding Wheaton College, a deeply conservative evangelical Christian school in Illinois. The college made headlines earlier this year when officials threatened to fire professor Larycia Hawkins after she claimed that Muslims and Christians worship the same God. The scandal sparked widespread outrage and accusations of Islamophobia, with Wheaton students and graduates — several of whom work in major media outlets — demanding the administration back off. But when Yusuf was asked to comment on the controversy, his measured response hinted at a deep sense of solidarity. He agreed the treatment of Hawkins was inappropriate, but insisted that Wheaton should be allowed to run their school according to their own theological rules — just like any other religious institution. “It is sad that Wheaton College took the actions that it did against [Hawkins’] beautiful act of support and solace,” he wrote. “[But] people must feel free to worship and teach their faith as they see fit, and our colleges should be protected in their approaches to doing so. Wheaton College is an important institution, and this is an unfortunate blemish on its record given its inquisitorial feel, but it is a learning process they are going through navigating new waters, and we should pray for them to do the right thing. Ultimately, Zaytuna’s experiment in fusing the liberal arts with Islam is, like all new schools, an ongoing one. Success still largely depends on whether or not leaders are able to continue to accrue financial support for the college, which, in turn, hinges on the quality of their graduates. In the meantime, however, students and teachers remain adamant that their westernized Islamic institution isn’t just novel, but necessary: when Bazian was asked how the college’s faculty and staff should react to America’s current political climate, where GOP frontrunner Donald Trump regularly spouts Islamophobic rhetoric as a vote-getting tactic, his answer cited not just Islamic teachings, but also the support of a famous Greek philosopher.